Without a doubt, the Sistine Chapel is one of the greatest treasures of all time. With its frescoed walls and Michelangelo’s famous painted ceiling, the Chapel’s beauty and magic envelop you the moment you walk in. In this huge thirteenth-century church you will find stunning frescoes, the remains of St. Francis, and some of the saint’s possessions. The basilica is more than an important stop for pilgrims; it’s the mother church of the Franciscan Order. Depart the United States for your overnight flight to Rome. Dinner and breakfast will be served on board. Rome, also known as the Eternal City, is one of the most magnificent cities in the world. After arriving you will be transported to your hotel. Unpack and relax before joining the rest of the pilgrims for Mass, dinner, and a Welcome meeting. Later in the evening, walk to St. Peter’s Square to pray the Rosary (optional). Following breakfast, take a walking tour of the iconic sites of Ancient Rome, including the Colosseum, the Roman Forum, and the Capitoline. In the afternoon, dip your hand in Trevi Fountain and see the Basilica of St. John the Lateran. Cross the street to find (and climb) the Holy Staircase. Attend Mass at the Basilica of St. Mary Major, and then enjoy dinner at a local restaurant. After breakfast, celebrate Mass in St. Peter’s Basilica. 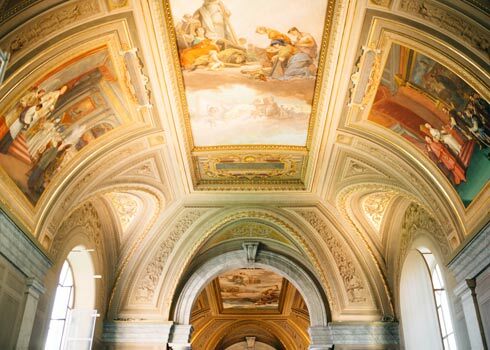 See awe-inspiring relics, works of art, and the Sistine Chapel as you tour the Vatican Museums. Return to St. Peter’s Basilica to visit the tombs of St. Peter and St. John Paul II. After lunch, go to the Basilica of St. Paul Outside the Walls, one of Rome’s four major basilicas. Take the Appian Way to the Church of Domine Quo Vadis, the ancient Baths of Caracalla, and more. Have dinner at a local restaurant. After a hearty breakfast, we will travel through the countryside to the Cathedral of Orvieto. This fourteenth-century church houses the Corporal of Bolsena (a Eucharistic miracle), and contains some of the most magnificent frescoes you will ever see. After lunch, we will journey the rest of the way to Assisi, the hometown of St. Francis. Dinner will be at the hotel. We will visit the tomb of St. Francis and the Basilica of St. Francis. The basilica, a huge thirteenth-century church containing many of St. Francis’ possessions, is one of the most important pilgrimage destinations in Italy. You will have the afternoon to explore this quaint hilltop town. Dinner will be at the hotel, followed by a group meeting. Following breakfast, go on a guided tour of Florence. See the Basilica of the Holy Cross (where Michelangelo and Galileo are buried), Palazzo Vecchio, the Uffizi Gallery, and the Cathedral of Santa Maria del Fiore. After lunch, visit the Accademia Gallery. Spend the afternoon exploring and enjoying some of the best shopping in Italy. Dinner will be in Assisi. Visit St. Mary of the Angels Basilica, the church where St. Francis spent most of his life after founding the Franciscan Order. See the small stone chapel where he lived and worked, the rose garden, and the cave where he went to pray. The afternoon is yours to enjoy last-minute shopping and sightseeing before our final dinner and group meeting. After breakfast, say “ciao” as the bus transports you to the airport for your flight home. Sometimes we need to step back from life and take another look at who we are, what we are here for, what matters most, and what matters least. Without the distractions of your everyday life, Italy provides a perfect opportunity to hear the voice of God. A pilgrimage is a wonderful opportunity to expand our knowledge and experience the world. 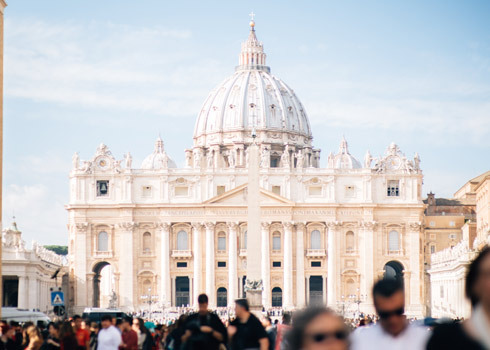 Explore Vatican City. Eat authentic Italian food. 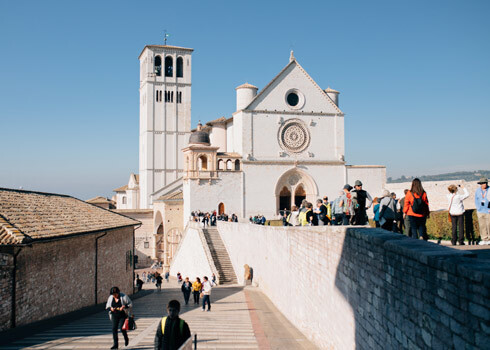 Stroll through the medieval streets of Assisi. Shop in beautiful Florence. View unique art and architecture. And see life through the eyes of people who call Italy home.